My boys used to be quite crazy over the anime, One Piece last year. The craze has died down a little this year, and I don't see them watching One Piece as often now. We brought them to J-WORLD in Tokyo for a visit last year. 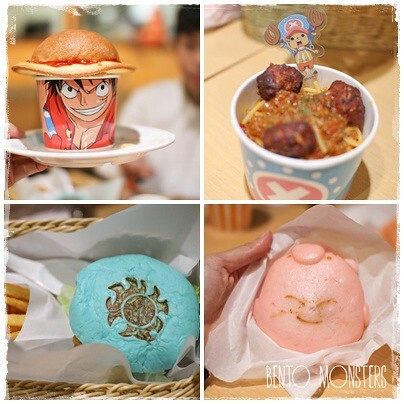 J-WORLD is an indoor theme park by Namco, it's based on popular manga characters like One Piece, Dragonball and Naruto. My boys actually asked for a Dragonball bento when we came back, I've yet to get that done, oops. -_- I ended up making Luffy from One Piece instead. 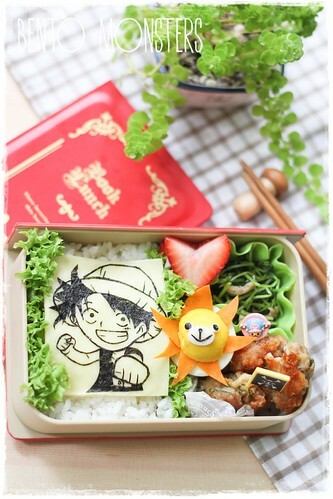 This Luffy bento was made while I was doing examinations revisions with IT in May. Speaking of exams, my boys exams are coming again soon, not so many topics covered this round, so revisions will be much easier. 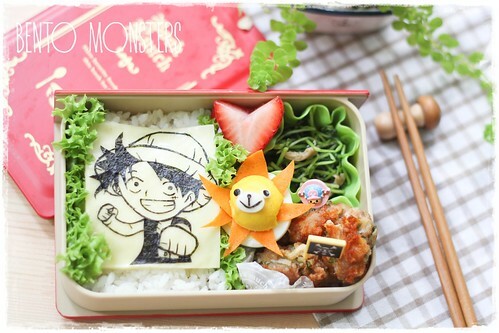 Luffy is just seaweed, which I cut out using a pair of scissors, and placed it on a slice of cheese. Sunny is made using hard boiled egg, cheese, carrots and nori. The side dishes were carrot meat patties and stir-fried pea sprouts with mushrooms. 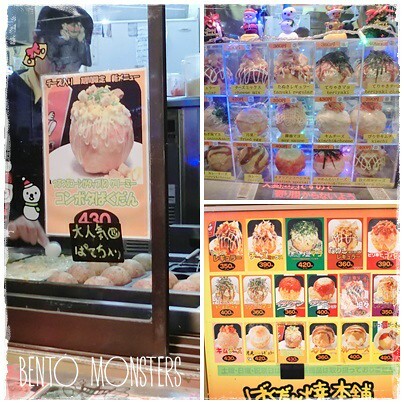 Sharing some food photos I took at J-WORLD. Even though my boys had a great time there, I won't exactly recommend the theme park, unless you are a manga fan. The entrance fees were cheap, but they charge for every ride. The theme park is also rather small, not worth making a special trip down. However, Sunshine City, where the theme park is located in, is a great place to shop. Some of the food we ordered, taste wise was just so-so, not fantastic, but not horrible either. 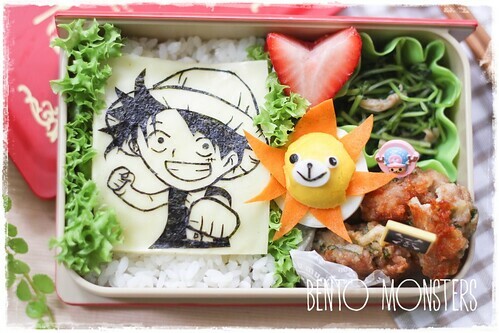 I love luffy! one piece is one of the best anime around! 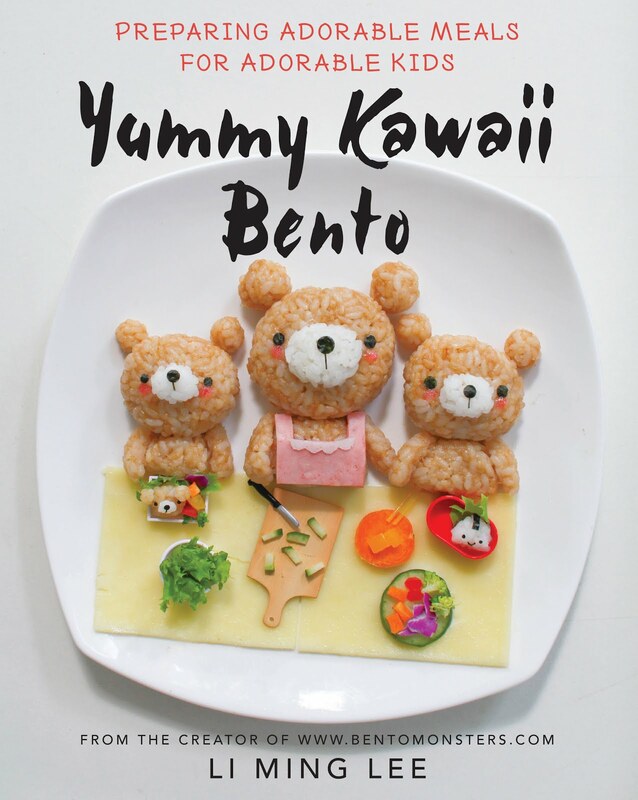 I love Sunny, so creative using hard boiled egg and your nori cut out is fantastic!! Ah...so nice, I want a new kitchen too! Yes, love it, they are using the Trudeau bag which has a wide base, so their boxes are packed in horizontally. 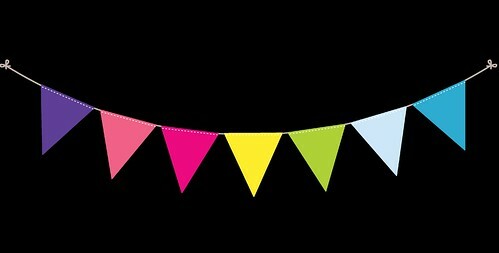 Btw what are the Totoro things on a plate in your banner?? 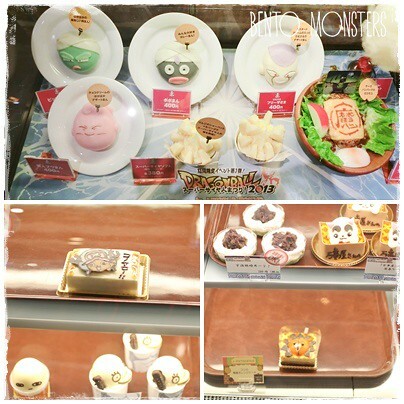 I did a Totoro search on your blog but didn't find it leh. Totoro macarons, not on the blog yet. I'm very lazy to update these days. Very busy in the day, at night I just feel like relaxing and watching K-dramas, lol. A lot I like recently, Fated to love u, Joseon gunman and high schooler king. Oooh, sounds so cool! My Neighbour is a Totoro-lover (haha) and would love to know how to make them. Yes totally KWYM! I catchup on Taiwanese dramas more and K-dramas only if recommended. For FTLY I'm not keen to watch yet cos I watched and loved the original Taiwanese version. But I like Jang Nara (although don't like the male lead, yet) so will consider after I finish Wild Chives and Soybean Soup d:) Will also check out the other two you mentioned. Thanks lah! Will definitely update, just don't know when. I made Totoro cream puffs too, waiting to update as well. Which tw drama is good these days? I used to love them but have given up on them 2 years ago, just find they aren't as good as b4, now I don't even keep track, so don't know whether have good ones. I'm a huge fan of tw Fated to love u too, n I've to say the korean remake is pretty good so far. They also made a remake of 败犬女王, but that one CMI, original was way better.